This vegetarian Bolognese starts with all the usual suspects — carrots, onion, celery. 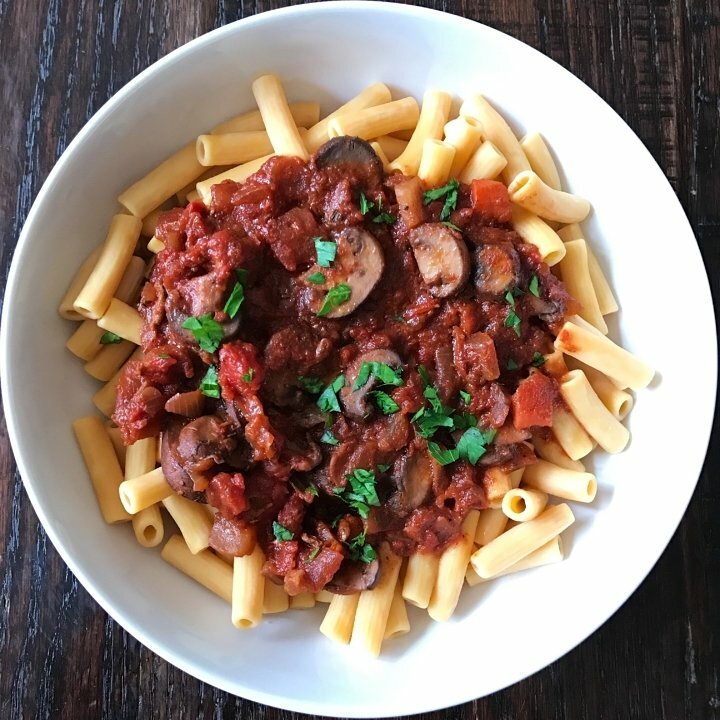 crushed tomatoes, dry red wine, and herbs– but instead of meat uses high flavor cremini mushrooms, dried porcini mushrooms and simmers with a chunk of Parmigiano-Reggiano rind. The flavor is unreal! We first discovered this dish and were introduced to the concept of umami — or savory, the fifth taste sensation along with sweet, sour, salty and bitter — back in 2009 when it was published in Cooking Light Magazine and we’ve been making it ever since! Recipe adapted from Cooking Light. I’ve been making this recipe exactly as is for years, except that we now use gluten-free pasta.